This Hilarious HeiHei costume from Moana is one of our family’s favorite movie characters. We work really hard every year to create wonderful lasting memories for our children and our grandchildren.We started taking our entire family to Disney World for their Halloween party 2 years ago when our granddaughters were 3 and 1 years old. I made costumes from Cinderella for the entire family that first year. Last year we all went as characters from Peter Pan. Our family had such an amazing time. It reminded me of an old fashioned Halloween from our childhood. It was like being a kid again. The family is all hooked on Disney Halloweens and can’t wait to go again this year. The girls are 5 ,3 and 1 years old and are crazy for Moana. I have to say we all are. I try to choose costumes based on the size and personality of the wearer. 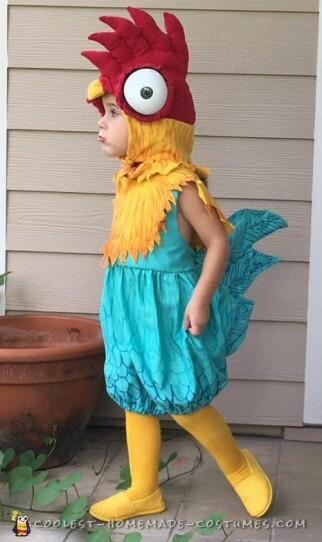 Crazy Hei Hei suits our 3 year old so well. In fact we call her Crazy Zoey. For the HeiHei costume,I have to consider that Orlando is almost always hot and humid in October. Therefore, I have to keep the costumes incredibly lightweight and comfortable. I created a romper from a lightweight blue sheet for the body of the rooster. The collar and head are made from an old yellow cab sheet. The red fabric is from an old t-shirt. I made the eyes from a dollar store foam ball that I cut in half and painted. The shoes are old shoes I painted yellow. The tights are old white tights I dyed yellow. Once the costume was built I used permanent markers to draw in the feathers and other details. In addition, the tail is built over a wire base to keep its shape. Fortunately, Crazy Zoey loves her costume and has been wearing it to play around the house. It is both light and comfy. Our family is is ready to take on Disney World and create some new memories for our growing family. So, we hope you get a laugh from our Hilarious HeiHei costume!